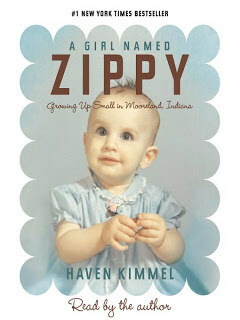 I’m no memoir writer but if I was to write a book about my life, I think it may end up something like A Girl Named Zippy. Our memoirs wouldn’t be similar because we had any of the same type of memories but because they would be a jumble of memories. This book skipped from memory to memory in a fashion that I would normally hate but for some reason loved this time around. What is this book about?This book is about nothing in particular. It is about plain ol’ life during her growing up years. About a little girl that we all were a little like while we were growing up. Zippy’s childhood years remind me of the American Dream. Not the American Dream that you would put on posters in neighboring countries to try and convince people to immigrate but the American Dream that existed in actuality. A family where animals roam the backyard in farm town America, where mom loves her soap operas and camping, not a extended trip to Europe is every family’s summer vacation. This book is the opposite of what most childhood memoirs are. Instead of telling all of us how many mistakes she made in childhood and what she has done as an adult to rectify them, Kimmel tells her stories with childlike simplicity. She makes no excuses for her actions. She states them in the voice seemingly of her inner child and lets you judge for yourself. Don’t worry, you won’t have anytime to judge Kimmel for her childhood actions, you will be too busy laughing at them to realize they were a little crazy.